As the 1960s dawned, Coca-Cola faced a challenge: A drink called Pepsi was siphoning off younger consumers with ads aimed at the "Pepsi Generation." One of Coke's (many) responses was this ad, which appeared in Life magazine in July 1963. Coke's challenge was how to portray the energy and carefree swagger of youth without overt suggestions of sexuality. 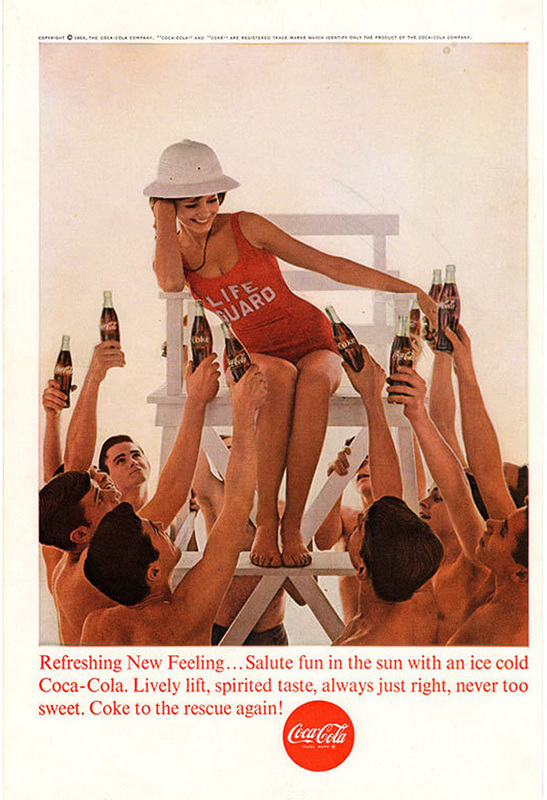 This ad did it better than than any other: 10 half-naked guys attempting to woo a shapely female lifeguard—with bottles of Coke, of course. Only the height of the lifeguard chair keeps her a chaste distance from their paws. Soon, Coke would turn up the sexual volume a bit with ads showing couples and the tagline "Things Go Better With Coke," implying "things" could be more intimate than a day at the beach.